Bananas are a tropical crop that theoretically performs best within 20° of the equator, with small fluctuations in night and daytime temperatures. In some aspects, the general subtropical climate might be more suitable, as heat stress during summer and leaf disease pressure are less in the subtropics. When water is not limiting, growth is determined by temperature. 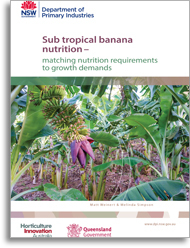 Grown along the wetter, coastal fringe in Australia, the ocean’s warming influence allows bananas to be grown within subtropical climates – 20° to 30° south of the equator – although growth does slow significantly during winter. As every farm is different and growers have different production aims, this guide is descriptive, not prescriptive. The images will allow you to become familiar with, and identify, banana nutrient deficiencies you might see on your farm. Once these deficiencies are evident, production has already been lost so it is important that monitoring, through leaf and soil tests, is used to plan and implement your nutrition program.